Taleban fighters using giant Afghan marijuana forests for cover are proving a tough foe to smoke out, the head of Canada's armed forces has revealed. Thickets three metres (10ft) high readily absorb heat, making them hard to penetrate with thermal devices, said Gen Rick Hillier in a speech in Ottawa. "You really have to be careful the Taleban don't dodge in and out of those marijuana forests," he added. Burning them is not an option as they are laden with water, the general said. He was quoted as saying by Reuters news agency that the crew of at least one armoured car had responded by camouflaging their vehicle with marijuana. Canada's armed forces have more than 2,300 personnel deployed in Afghanistan as part of the Isaf international force and have suffered at least 40 fatalities since 2002. "We tried burning [the marijuana forests] with white phosphorous - it didn't work," said Gen Hillier. "We tried burning them with diesel - it didn't work. The plants are so full of water right now... that we simply couldn't burn them." He noted that a couple of brown plants on the edges of some of the forests had caught fire but this had posed yet another problem. "A section of soldiers that was downwind from that had some ill effects and decided that was probably not the right course of action," he said, speaking dryly, according to Reuters. "Sir, three years ago before I joined the army, I never thought I'd say 'That damn marijuana'." Marijuana, an illegal drug in most parts of the world, grows wild across Central Asia, where it is commonly regarded as a weed. With illicit marijuana production on the rise in Canada itself, police there recently identified fighting the drug as their "biggest issue". I have seen marijuana growing right outside of my house when I was growing up by the Afghanistan border in Pakistan and am totally against eradicating the plant without providing an alternate both to the farmers and the land. Besides being a part of the farmers livelihood, marijuana is probably the only plant which can easily be grown to keep the area green and protect it from erosion. On the other hand, it helps retain water and protect other plants and trees around them. 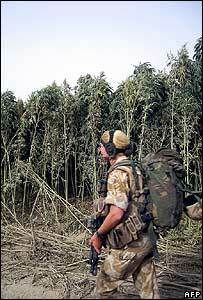 In 2003 working for the UN in the South-East we encountered two types of marijuana plant production. The first was grown for 'export' as part of the drug trade and is a smaller plant with long head which contains a concentration of THC - the active substance in marijuana. The second and most common was the marijuana forest which is grown for its hemp and for feeding cattle. From the photos and description I believe it is this latter type that the troops encountered. Burning or otherwise destroying it would require some fore-thought as it probably is part of some poor farmer's livelihood.